Kids seem to grow out of things so fast. Clothes, gear and toys rarely seem to last very long those first few years. But the Zany Zoo by B. 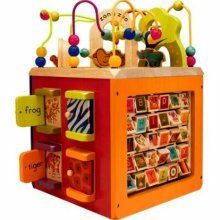 Toys is a fun, interactive toy that will amuse kids from 6 months to 3 years. Perfect for amusing little ones, the Zany Zoo teaches kids about animals, letters, colors and helps to develop their fine motor skills. I love the color palate of the Zany Zoo, the sturdy, smooth wood and the versatility. Right now my 4-month-old is amused by spinning the tiles, but I know that pretty soon he’ll be investigating the animals and moving parts. Plus I love that it’s a toy I don’t mind leaving out in the living room. Others have taken notice too – the Zany Zoo has garnered praise from the Parents’ Choice Awards and the Creative Child 2010 Toy of the Year. Disclaimer: B. Toys sent a sample of the Zany Zoo for this review.